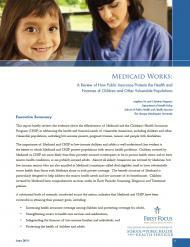 Authored by Professors Leighton Ku and Christine Ferguson of the George Washington University School of Public Health and Health Services and commissioned by First Focus, the report describes the enormous success of Medicaid and the Children’s Health Insurance Program in increasing health insurance coverage among children; strengthening access to medical, health, and developmental services; and safeguarding the finances of low-income families and individuals. The brief also explores the potential impact of the fiscal year 2012 budget resolution approved by the House of Representatives, which would block grant the Medicaid program. Such a proposal would end Medicaid as we know it- causing states to reduce enrollment, limit benefits, cut provider payments, and shift more costs onto the children and families who rely on public programs. See our fact sheet summary of this report here.